Introduction: To date, there have been many studies indicating the positive effects of stem cells on treating liver cirrhosis. In this study, we used umbilical cord blood-derived mesenchymal stem cells (UCB-MSCs) for treatment in a mouse model of liver cirrhosis. Specifically, we determined and compared the effectiveness of two methods of MSC injection (tail vein versus portal vein). Methods: Liver cirrhosis in male Swiss mice (of age approximately 11 weeks or under) was induced by administration of carbon tetrachloride (CCl4; 1 ml/kg). One million UCB-MSCs were then transplanted into cirrhotic mice via the portal vein or tail vein. After 21 days, blood samples were collected for measurement of transaminase, bilirubin and albumin. The expression of fibrosis-associated genes, specifically procollagen – alpha 1 and integrin – beta1, were assessed using quantitative RT-PCR. The histopathology of the specimens was also evaluated using hematoxylin/eosin, Masson trichrome staining, and immunohistochemistry using collagen type 1 and alpha-SMA antibodies. Results: After 21 days, cirrhotic mice treated with UCB-MSCs showed recovery of bilirubin index, increase of liver albumin synthesis, inhibition of fibrosis-related gene expression (e.g. procollagen – alpha 1 and integrin – beta1), and remodeling of liver histology. From comparison of the different routes of transplantation, UCB-portal route was significantly more effective than UCB-tail route at reducing aspartate transaminase (AST) activity and bilirubin index (P<0.05), and inhibiting procollagen – alpha 1 and integrin – beta1 expression (P<0.05). UCB-MSCs from both transfusion routes showed accelerated improvement of liver histopathology. Conclusion: Therapeutic strategies using UCB-MSCs have proven to be promising for the treatment of liver cirrhosis. Injection of UCB-MSC via portal vein was more effective than tail vein for cirrhosis treatment. Liver cirrhosis was initially defined by Anthony et al. as “a diffuse process characterized by fibrosis and the conversion of normal liver architecture into structurally abnormal nodules” Anthony et al., 1978 . The unusual structures (i.e. scars or nodules) are formed to replace parenchymal cells which results in the dysfunction of liver and ultimately liver failure. Indeed, liver fibrosis is one of the highest risk factors for liver cancer Schuppan and Afdhal . According to global statistics, liver disorders have been the predominant cause of over 2 million deaths annually to 2015; approximately 1,200,000 deaths have occurred from chronic liver diseases and liver cirrhosis, and about 800,000 deaths from liver cancer Wang et al. . Liver cirrhosis can result from a variety of causes, including chronic alcohol abuse, infection with hepatitis viruses (HBV, HCV, etc. ), exposure to hepatotoxins, bile duct degeneration, and autoimmune disorders. These factors promote chronic inflammation in the liver, damage-induced cell death Luedde et al. , accumulation of lipid droplets and hepatic steatosis, reduction of parenchymal cell number, and activation of hepatic stellate cells (HSCs). The activated HSCs can transform into myofibroblasts, causing an increase in cell number. Activation of HSCs is the main reason for the mass production of the extracellular matrix (ECM) Geerts et al., 1991 Lee et al., 2015 . It is the accumulation of ECM that causes scar structures which eventually advance into liver cirrhosis. Besides eliminating the causes of liver injury, therapies for liver cirrhosis have focused on inhibiting cirrhosis progression, relieving symptoms, and regenerating liver tissue. These attempts have included anti-inflammation and anti-oxidation therapies. Moreover therapies have concentrated on activation/ protection of hepatocytes and inhibition of HSC activation, along with the simultaneous dissolving of scar tissue and replacement of damaged hepatocytes or liver tissue using cell transplantation Bataller et al., 2005 . Recently, stem cell therapy have proven to be a promising strategy to treat liver cirrhosis Eom et al., 2015 Forbes and Newsome, 2012 Guo et al., 2016 . The main advantages of stem cell therapies are replacement of damaged hepatocytes by induction of stem cell differentiation into functional cells Si-Tayeb et al., 2010 Touboul et al., 2016 Xue et al., 2016 and inhibition of inflammation via immune modulation Gao et al., 2016 Nauta and Fibbe, 2007 . Stem cells also enhance hepatocyte function by releasing growth factors Fitzpatrick et al., 2015 Zhang and Wang , inhibiting HSC activation and releasing matrix metalloproteinases (MMPs) to dissolve scar tissue Aki et al., 2015 Amer et al., 2011 . To date, there have been a large number of clinical trials using stem cells to treat liver cirrhosis Shiota and Itaba, 2016 . These studies have exploited various types of stem cells, including mesenchymal stem cells (MSCs), hematopoietic stem cells, and liver progenitor cells. Stem cells have been tested at various doses and administered through various routes. The route of stem cell transplantation can affect not only stem cell homing but also therapeutic efficiency Kurtz, 2008 . In liver disease treatment, Zhong et al. (2013) showed that the magnetic resonance imaging (MRI) signal of labeled MSCs after infusion via portal vein was more effective for cell migration into liver than caudal vein Zhong et al., 2013 . In the study herein, we investigate two methods of MSC injection to discern the optimal route for administering MSCs. In our study, we evaluate umbilical cord blood derived MSCs (UCB-MSCs) due to their availability, potential for proliferation and differentiation, and efficiency for treating liver disease Pham et al., 2014 Xue et al., 2015 . In a mouse model of liver fibrosis, we compare the efficacy of two methods to deliver UCB-MSCs: caudal (tail) or portal vein. The study approved by our Institutional Ethics Committee of Laboratory of Stem Cell Research and Application, University of Science, VNU-HCM, Vietnam. A mouse model of liver cirrhosis were generated according to previous protocols Truong et al., 2014 . In brief, 6-week old male Swiss mice were treated with carbon tetrachloride (CCl 4 ) (UniChem, China) dissolved in olive oil (3:7 v/v) at a dose of 1 ml/kg three times per week for a total of 11 weeks. After 11 weeks, mice were divided into 5 groups (with n=5 per group). The 5 treatment groups included: untreated (no injection), placebo-tail (PBS injected into the tail vein), placebo-portal (PBS injected into the portal vein), UCB-tail (UCB-MSCs injected into the tail vein), and UCB-portal (UCB-MSCs injected into the portal vein). Additionally, there was a control group (healthy mice). UCB–MSC cell line was provided by our institute (Institute of Stem Cell, University of Science, Ho Chi Minh City). The cell line was harvested and established using a previously published protocol (Pham et al., 2014). UCB-MSCs were thawed and cultured in medium containing DMEM/F12, 10% FBS, 1% antibiotic (Sigma-Aldrich, Louis St, MO) at 37°C, 5% CO 2 . Cell surface markers were determined by flow cytometry using anti-CD14, anti-CD24, anti-CD45, anti-CD90, anti-CD166, and anti-CD44 antibodies, either conjugated with FITC or PE (BD Biosciences, San Jose, CA). Stem cells at the 6th passage were detached by trypsin/EDTA, 0.25% (Sigma-Aldrich, St. Louis, MO) and filtered through a 70µm cell strainer to harvest single cells for infusion. MSCs (1x10 6 ) were resuspended in 150 ul phosphate buffer saline (PBS) and then injected via portal or tail vein into mice with liver fibrosis. For stem cell delivery via tail vein, insulin syringes (BD Biosciences) and restraining tubes were used during the administration process. For portal vein injection, mice were anesthetized with ketamine/xylazine prior to injection ( Figure 1 ). Peripheral blood was obtained to harvest plasma. Enzyme activity of aspartate transaminase (AST) and alanine transaminase (ALT) were evaluated using AST/ ALT kit (Diagnosticum Inc., Hungary). The concentrations of bilirubin and albumin were assayed with QuantiChrom™ Bilirubin Assay Kit (BioAssay Systems, Hayward, CA) and QuantiChrom™ BCG Albumin Assay Kit (BioAssay Systems), respectively, and according to the manufacturer’s instructions. Small amounts of liver tissue were obtained by liver biopsy for total RNA extraction using Easy-BLUE™ Total RNA Extraction Kit (iNtrON Biotechnology, South Korea) according to manufacturer’s instructions. Quantitative RT-PCR reactions were carried out using Brilliant II qRT-PCR Master Mix Kit, 1-Step (Agilent, Santa Clara, CA) with procollagen α1 primers (forward: 5’-CCTGGACGCCATCAAGGTCTAC-3’;reverse:5’-CAAGTTCCGGTGTGACTCG-3’), integrin beta-1 primers (forward: 5’-GCCAGGGCTGGTTATACAGA-3’; reverse: 5’-TCACAATGGCACACAGGTTT-3’), and housekeeping gene GAPDH (forward: 5’-AAGTTGTCATGGATGACC-3’; reverse: 5’-ATCACCATCTTCCAGGAGC-3’). The Ct values were analyzed using the Livak’s method. Liver tissue samples were fixed in 4% paraformaldehyde solution (Sigma-Aldrich) for at least 24 hours. Fixed samples were embedded in paraffin, sectioned into 5µm-thick slices and stained with Hematoxylin/Eosin (Sigma-Aldrich) and Trichrome (Sigma-Aldrich), according to previous protocols Truong et al., 2016 . Immunohistochemistry of the sections was also done according to previous protocols Truong et al., 2016 . In brief, slides were deparaffinized/rehydrated, blocked with blocking serum buffer, with two washes after each step. Then, slides were stained with anti-SMA-alpha antibody (Santa Cruz Biotechnology, Inc., Dallas, TX) and anti-collagen type 1 antibody (Santa Cruz Biotechnology). ACE kit (Sigma-Aldrich) was used as the source of substrate to observe immunocomplexes. All data were analyzed by Student’s t-test using Prism 6.0 (GraphPad Software, Inc., La Jolla, CA) and described as mean±SD. Differences were considered statistically significant when p-value ≤ 0.05. Thawed UCB-MSCs exhibited homogeneous morphology with spindle-like shape and showed robust proliferation ( Figure 2A-C ). Moreover, flow cytometry analysis of cell surface markers showed that the cells were negative for CD14, CD34, and CD45, but positive for CD90, CD166, and CD44 ( Figure 2 ). Observation of the thawed cells showed they maintained proliferation and retained their stem-cell properties Pham et al., 2014 . UCB-MSCs contributed to the improvement of bilirubin and albumin levels in mice bearing liver fibrosis. Untreated liver-fibrosis bearing mice showed acute liver damage ( Figure 2 ), as indicated by high activity of AST (240.60±16.87 U/L), ALT (411.9±81 U/L). The increase of bilirubin (0.26±0.02 mg/dL) and decrease of albumin (1.73±0.0417 mg/dL) reflects liver dysfunction in these untreated mice. For the treatment groups, after 21 days of injection the PBS-treated (placebo) group and UCB-MSC treated groups showed a reduction of AST/ALT index. 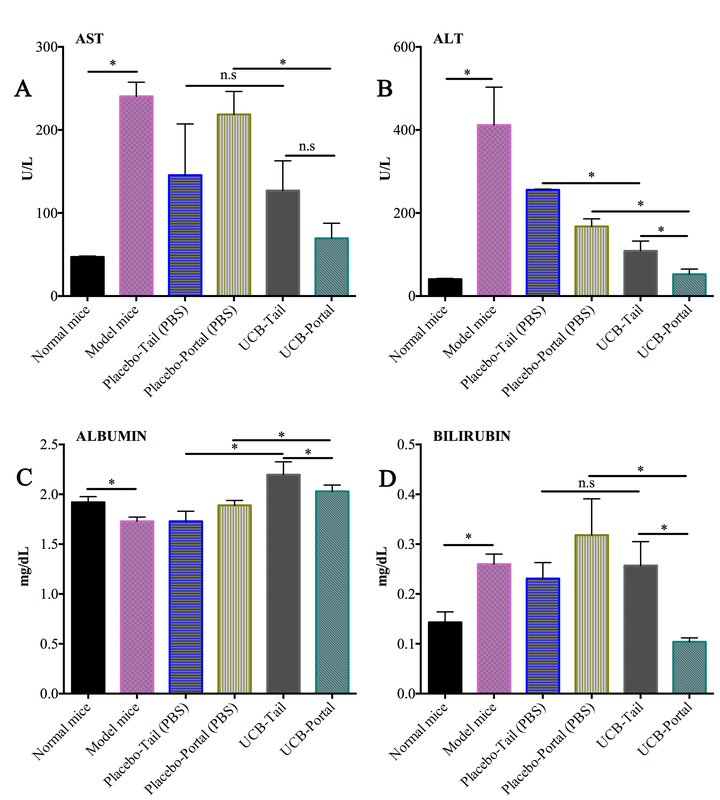 However, the UCB-MSC treated mice showed a significantly improved level of bilirubin index and albumin, compared to the placebo group (p<0.05) ( Figure 3 ). (A) and (B) The level of ast and alt (liver injury serum marker) at day 21th after stem cell transfution; (C) and (D) The level of bilirubin and albumin (liver function serum marker) in the groups at day 21th after treatment stem cell transfusion. As for the comparison of portal and tail vein route, the portal vein group showed greater efficacy in terms of biochemical index recovery than the tail vein group. The UCB-portal group showed a significantly greater reduction of AST (69.5±18.15 U/L) and bilirubin index (0.104 ± 0.0082), when compared to UCB-tail group (127.09±35.764 U/L and 0.2574±0.04797, respectively; p<0.05). With respect to gene expression, untreated mice showed an overexpression of integrin beta 1 (~1,223,430-fold greater than healthy mice) and of procollagen α1 expression (~250-fold). These results imply that extracellular matrix and collagen are being overproduced in the liver tissue. 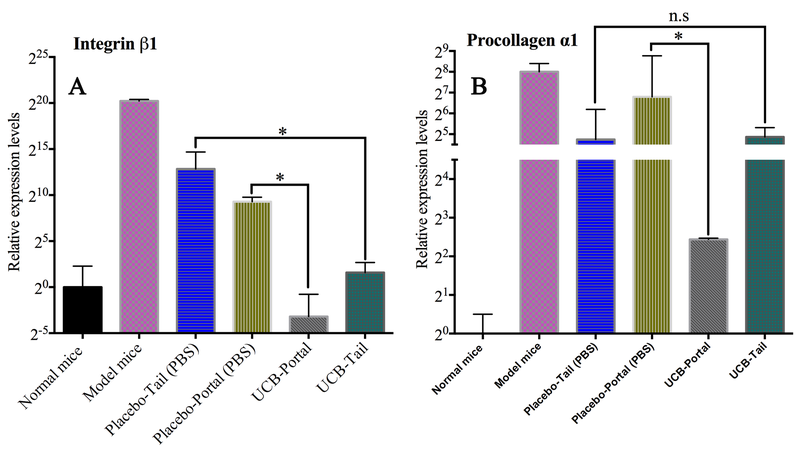 After 21 days of UCB-MSC infusion, the expression of integrin beta 1 in UCB-tail and UCB-portal groups were equivalent to healthy mice (expression normalization group); however, the placebo group showed upregulation compared to the healthy mice (~620-fold in the placebo-portal and ~7,350-fold in the placebo-tail groups) ( Figure 4 ). (A) The expression of integrin beta 1 expression in the experiment groups; (B) The expression of procollagen α1 expression in the experiment groups. (Student T-test P-value=0.05, * significant difference, n.s: nonsignificant difference). From results of H&E staining, our mouse model of liver cirrhosis exhibited abnormal liver structure and histology, loss of parenchymal cells, increase of white blood cell infiltration into perivascular tissues, hepatocyte death, and hepatocyte steatosis ( Figure 5C ). There were many myofibroblasts (α-SMA positive cells) observed in the liver tissues of cirrhotic mice ( Figure 6 ). (A) and (B) Healthy mice; (C) and (D) Model mice; (E) and (F) Placebo-tail group; (G) and (H) Placebo-portal group; (I) and (J) UCB-tail group; (K) and (L) UCB-portal group (blue arrows indicate high infiltration of immune cells, and yellow arrows indicate area of collagen stained with Trichrome dye). (A) and (B) Healthy mice; (C) and (D) Model mice; (E) and (F) Placebo-tail group; (G) and (H) Placebo-portal group; (I) and (J) UCB-tail group; (K) and (L) UCB-portal group (blue arrows indicate the SMA-alpha-positive cells, yellow arrows indicate the areas of collagen type 1 expression. Trichrome staining also showed collagen fibers in the liver (fig. 4D). Indeed, liver tissues of the placebo (PBS) group shared similarities with the untreated mouse group ( Figure 5E-H ). On the contrary, stem cell treated groups showed an improvement in liver histopathology ( Figure 5I-L ). Specifically, UCB-MSC-treated groups showed a decrease of white blood cell infiltration and reduction of hepatocyte steatosis. 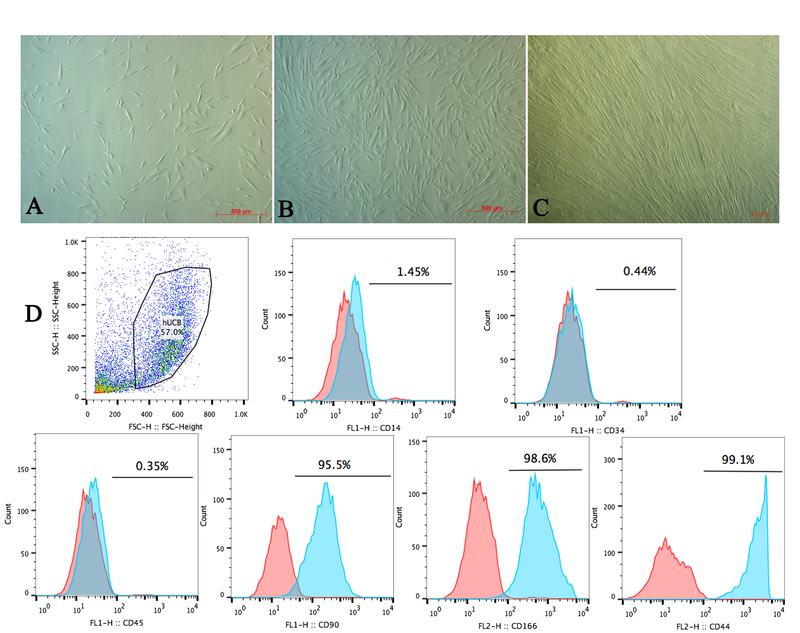 Furthermore, the trichrome staining showed a decomposition of scar tissues and, notably, diminishment of myofibroblast cell number (α-SMA+ cells) and collagen type 1 positive cells in the treated groups ( Figure 6I-L ). There was no significant difference between tail vein versus portal vein route of administration in terms of histological structure, inflammation, steatosis, or scar tissue formation. Morphology and surface marker expression of UCB-MSC. (A) UB-MSC after 3 days of thawing; (B-C) UCB-MSC proliferation at 50% and more than 90% confluency (respectively); (D) MSC surface markers analysis. In this study, after 21 days of ceasing CCl 4 , both placebo-treated and untreated cirrhotic mice showed reduced liver damage as indicated by a decrease of AST/ALT index, recovery of histology, and reduction of fibrosis-related gene expression. Presumably, the liver of these mice were capable of self-regeneration. The cause of the self-regeneration has been explained by the ceasing of CCl 4 administration during the 21 days of treatment. Other studies have shown similar results to our study Carvalho et al., 2008 Kuo et al., 2008 . However, our study uniquely demonstrates that stem cell treatment in cirrhotic mice was better for restoring liver function and histology (significantly better than placebo treatment). The effects of stem cell treatment in our mouse model of liver cirrhosis may be attributed to stem cell immunomodulation, stem cell homing and differentiation, and secreted cytokines Berardis et al., 2015 . In terms of stem cell therapy for liver cirrhosis, there are several routes for stem cell infusion; these include peripheral vein, portal vein, intrahepatic, and intrasplenic routes. The safest routes for stem cell injection is peripheral vein (tail vein of mice), and the closest to liver (portal vein). The route of stem cell administration affects stem cell resting and "homing" in organs or tissues following transplantation. The various routes result in different cell distribution, number, action, and efficacy of stem cell in an organism. In this study, we observed that AST/ALT/bilirubin/albumin levels in the UCB-MSC treated groups were significantly improved compared to the placebo group. The results also showed that stem cell injection via portal vein was significantly better than tail vein. This was reflected by the significant improvement in liver injury/function index (ALT/bilirubin/albumin levels) induced after portal vein (UCB-portal) injection compared to tail vein (UCB-tail) injection. Similar to biochemical index, it was observed that expression of fibrosis-related genes changed positively in the MSC treated groups. Moreover, the portal vein group showed the greatest inhibition of procollagen α1 and integrin beta 1 expression (more efficient than the tail vein group). Indeed, it has been reported that the route of stem cell administration affects stem cell resting and "homing" in organs/tissues. Different routes can result in different cell distribution, number, action, and efficacy of stem cells in an organism. Since the portal vein is the closest route to the liver, most of the cells should localize in the liver, whereas most cells via tail vein injection will travel to many sites in the body. 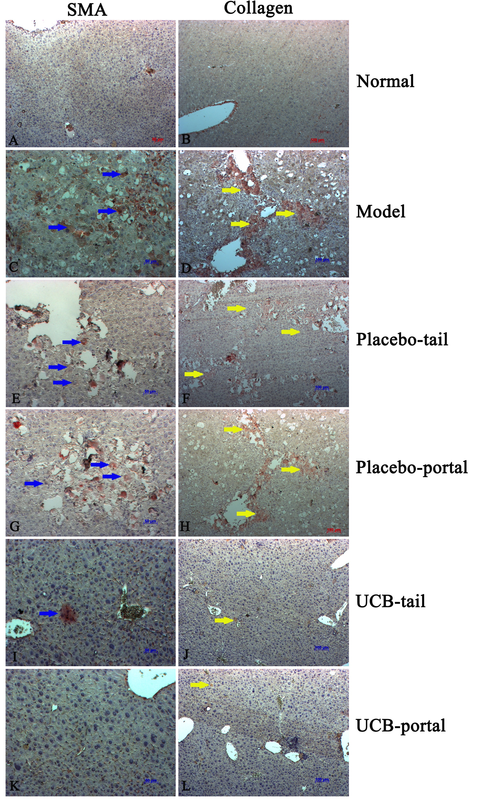 The results of H&E, trichrome, and immunohistochemistry staining revealed that UCB-MSC treatment promoted a positive change in histopathology, reduction of collagen fiber, and inhibition of hepatic stellate cells in the liver tissue. Moreover, down-regulation of α-SMA cells reflect a decrease of myofibroblasts in the liver Hinz, 2007 . Therefore, our study results are in accordance to those of Yoon Ok Jang et al. Jang et al., 2014 , Sakaida, Terai Sakaida et al., 2004 , and Krizhanovsky, et al. Krizhanovsky et al., 2008 . Moreover, paracrine effects of MSCs may play a significant role in reducing fibrosis in cirrhotic mice. In our study, the two stem cell treated groups (portal vein and tail vein groups) showed no significant difference in terms of histological evaluation. Similar to our study, recent studies in rats have also found that MSC infusion via portal vein is more beneficial than caudal vein with regards to MSC "homing" and improvement of liver function Zheng et al., 2015 . In a study by Sun et al. (2014) which compared four different routes of bone marrow (BM)-MSC transplantation in a rat model, portal vein administration was found to have greater impact on stem cell "homing" than the other routes Sun et al., 2014 . Furthermore, portal vein was the best route for transplanting MSCs and improved rat liver function compared to hepatic artery, peripheral vein or intrahepatic routes Sang et al., 2016 . Fundamentally, the function of the portal vein is to serve as the main blood vessel which brings blood from the intestines directly to liver sinusoid network such that portal vein injection promotes "cell homing" to liver tissue more than other routes Fan et al., 2001 Zhang et al., 1994 Zhong et al., 2013 . For that reason, and from our study results, the portal vein should be regarded as a priority route for UCB-MSC treatment of liver cirrhosis, with careful considerations to eliminate the risk of bleeding and damage to the recipient organ Paul et al., 2009 . 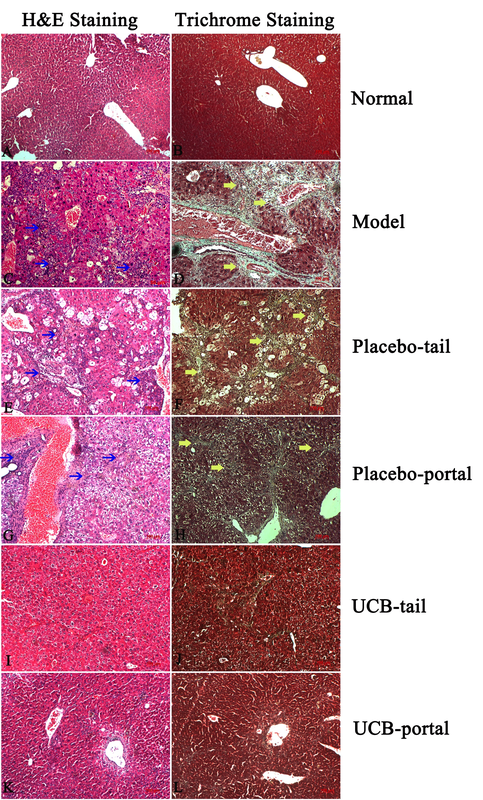 Transplantation of UCB-MSCs is a promising method for treating liver cirrhosis. In this study, UCB-MSC transplantation via portal vein, as compared to tail vein, was significantly more efficient at reducing liver injury, improving liver function and inhibiting expression of fibrosis-related genes. Thus, portal vein administration may be an optimal route for UCB-MSC administration in the treatment of liver cirrhosis. Trinh Van Le conducted experiments, acquisition of data and compose the first manuscript. Nam Hai Nguyen and Huy Quang Do established the mouse model, acquisition data of liver function, gene-expression. Huy Minh Le made substantial contributions to analyze the histology change. Nhung Hai Truong made substantial contributions to conception and design, data analysis and interpretation of data. Being corresponding author, Truong Hai Nhung give final approval of the manuscript to be submitted and any revised version. All authors read and approved this manuscript before it was submitted.